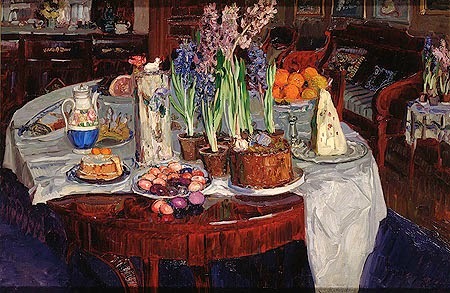 Hope your Easter table was something like this one. Here's what the Holy Father had to say at the Easter Vigil. “Entering the tomb, they saw a young man sitting on the right side, dressed in a white robe…” (Mk 16:5). The women were the first to see this great sign, the empty tomb; and they were the first to enter…“Entering the tomb”. It is good for us, on this Vigil night, to reflect on the experience of the women, which also speaks to us. For that is why we are here: to enter, to enter into the Mystery which God has accomplished with his vigil of love.We cannot live Easter without entering into the mystery. It is not something intellectual, something we only know or read about… It is more, much more!“To enter into the mystery” means the ability to wonder, to contemplate; the ability to listen to the silence and to hear the tiny whisper amid great silence by which God speaks to us (cf 1 Kings 19:12).To enter into the mystery demands that we not be afraid of reality: that we not be locked into ourselves, that we not flee from what we fail to understand, that we not close our eyes to problems or deny them, that we not dismiss our questions…To enter into the mystery means going beyond our own comfort zone, beyond the laziness and indifference which hold us back, and going out in search of truth, beauty and love. It is seeking a deeper meaning, an answer, and not an easy one, to the questions which challenge our faith, our fidelity and our very existence.